How Does Soil Moisture Effect Soybean Yield? Soil moisture is an overlooked facet in the analysis of weather trends’ effect on soybean yield. In fact, not one published analysis of yield impact from trends in rainfall and temperature includes soil moisture. One possible explanation is that soil moisture is not measured routinely. The United States Weather Bureau was established in 1870 within the Department of War (the Weather Bureau is now called the National Oceanic and Atmospheric Administration – NOAA – and is within the Department of Commerce). While NOAA has monitored daily temperature and precipitation since the 1880s through a network of trained volunteer observers, a national soil moisture network has never been established. 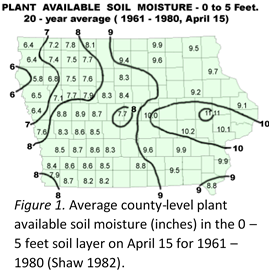 Iowa State University (ISU) provided leadership by performing soil moisture surveys across Iowa from the 1950s into the 1980s (Figure 1). The average of plant-available water in the 0 – 5 feet layer at the beginning of planting season was found to range 6.5” in northwest Iowa to 10.2” in eastern Iowa. These surveys provided far more detailed information than currently reported by the United States Department of Agriculture in the weekly Weather and Crop Bulletin and by NOAA in its simulated soil moisture data archive and daily update. Soybean producers know soil moisture affects their yield, but guidance on soybean yield loss from inadequate soil moisture is limited in Iowa, where soil moisture’s effect on corn yield has received much more attention. Some insight can be gained from irrigation trials outside of Iowa. In eastern Nebraska on silt loam and silty clay loam soils, irrigation delayed until pod fill resulted in yield indistinguishable from (but sometimes slightly higher than) full season irrigation (Klocke et al. 1989), and a similar result was found on silty clay loam in Missouri (Korte et al. 1983). This suggests pod fill is the most important development phase for ensuring soybean plants have adequate water. In Iowa, an ISU study on a 40-acre field evaluated the yield effects of water stress, soybean cyst nematode, soil pH and weeds during 1995, 1997 and 1999. The study found water stress contributed 75 percent of the total yield loss on average (Paz 2000); however, water stress primarily occurred in poorly drained or very poorly drained soil. This article quantifies soil moisture effect on soybean yield in Iowa. A data model is developed to predict county-level yield for the period of 1980 – 2012 using temperature, precipitation and simulated soil moisture (Anderson et al. 2016; Table 1). Separate data models were developed for the three predominant Iowa landforms: Des Moines Lobe, South Iowa and Northeast Iowa. Table 1. Predictor environmental variables for county-level yield data model. Units of temperature (T), rainfall (R) and simulated soil moisture (SM) are OF, inches, and inches, respectively. Average value is reported for each of three dominant landform regions in Iowa. Soybean yield average (bu ac-1) and yield trend (percent increase per year) included below the predictor data. The data model identified a low and high value for soil moisture. It selects the values at which the yield slope changes. In this case, the yield slope is not a change in yield over time (i.e., soybean yield trend). Instead, it is the change in yield per inch of soil moisture. When the slope is positive, it means yield increases as soil moisture increases and vice versa. Then, a change in slope could mean a change from positive to negative, positive to much more positive, or positive to neutral, or the same three combinations but with negative slope rather than positive slope. The data model predicts the percent yield change per inch of soil moisture change. A value of +1% means the soybean yield is predicted to increase by 1 percent with a 1” increase in soil moisture and decrease by 1 percent with a 1” decrease in soil moisture. A value of -1 percent means the soybean yield is predicted to decrease by 1 percent with a 1” increase in soil moisture and increase by 1 percent with a 1” decrease in soil moisture. The soil moisture values identified as the threshold values for yield slope change and the percent yield change are shown for May 1st and July 1st soil moisture in Table 2. Table 2. Soil moisture slope change values (in parenthesis) and percent yield change by Iowa landform. The soil moisture threshold values are not the same in each Iowa landform region. For May 1st, the low soil moisture value is lowest in the Des Moines Lobe (4.31”), highest in Northeast Iowa (6.03”) and in between in South Iowa (5.25”). This indicates the Des Moines Lobe is most sensitive to low May 1st soil moisture. Any producer on the Des Moines Lobe will agree with this finding, because each producer is aware that soil moisture drainage prior to May 1st is necessary nearly every year to prevent delayed planting. The added yield from dry soil on May 1st is substantial in the Des Moines Lobe as the model predicts a 3.42 percent increase of yield for each inch below 4.31” of May 1st soil moisture. In contrast, dry May 1st soil in South Iowa and Northeast Iowa reduces rather than increases yield. When does added soil moisture improve yield? The results for July 1st soil moisture are clear for South Iowa and Northeast Iowa but require some explanation for the Des Moines Lobe. The Des Moines Lobe yield slope thresholds for July 1st soil moisture are 7.52” and 7.68”. These values are very close to each other, and this means the slope change could be represented as a single value rather than two. The important information is this: above 7.68” the yield is drastically reduced. That means, the Des Moines Lobe soil can become way too wet in the summer for soybeans. Below 7.52”, the wet soil is tolerable to soybeans but the yield is higher as soil moisture is decreased below 7.52”. In contrast, yield increase is predicted above the high soil moisture threshold in South Iowa (6.83”) and Northeast Iowa (7.62”). The positive yield effect is greater in South Iowa (+6.16%) compared to Northeast Iowa (0.77 percent). Anderson, C.J., Babcock, B.A., Peng, Y., Gassman, P.W. and Campbell, T.D., 2015. Placing bounds on extreme temperature response of maize. Environmental Research Letters, 10(12), p.124001. Klocke, N.L., Eisenhauer, D.E., Specht, J.E., Elmore, R.W. and Hergert, G.W., 1989. Irrigation soybeans by growth stages in Nebraska. Applied Engineering in Agriculture, 5(3), pp.361-366. Paz, Joel Obien, “Analysis of spatial yield variability and economics of prescriptions for precision agriculture: a crop modeling approach ” (2000). Retrospective eses and Dissertations. Paper 13920. Shaw, R.H., 1982: Soil Moisture and moisture stress prediction for corn in a western corn belt state. Korean Journal of Crop Science, 28, 1-11.